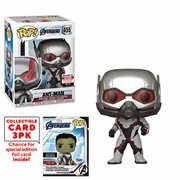 Exclusively from Entertainment Earth! 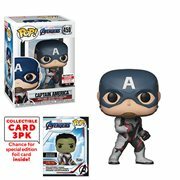 When you order one of these fantastic 3 3/4-inch tall Pop! 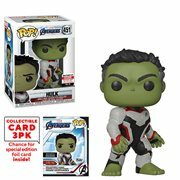 Vinyl figures of your favorite heroes and villain from the exciting Avengers: End Game movie, you'll also receive a foil pack containing 3 randomly selected, very limited edition collector cards (sometimes known as "trading cards") themed to the film! The 11 Pop! vinyl figures span the MCU's history and include Iron Man, Captain Marvel, Captain America, Thor, Black Widow, Hawkeye, Hulk, War Machine, Nebula, Ant-Man, and Thanos. 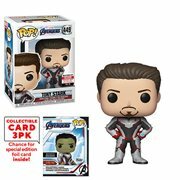 There are 16 different cards to collect - one for each character, plus rare holographic foil chase versions of Tony Stark, Captain America, Hulk, Thor, and Thanos - so get your order in now! Limit 6 figures per customer, while supplies last. Please note that collector card selection is random and the cards are in blind packaging. So, we cannot accept requests for specific cards, nor can we accept returns on opened items. You may receive duplicates. New! 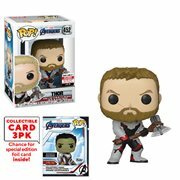 Avengers Pop! Vinyl Figures with Collector Cards!